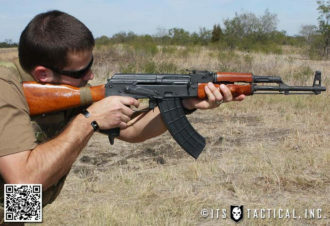 Despite the article title, US Palm certainly makes more than just gear and parts for the AK platform, but our primary focus in this article will be showcasing a few of their AK specifics. 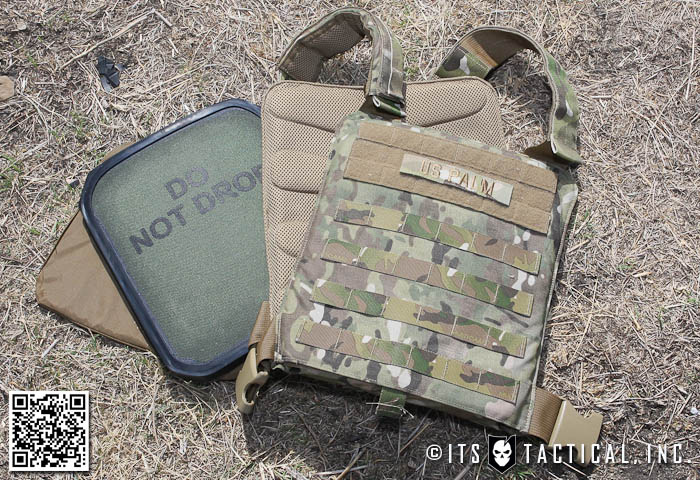 We’ll also be taking a look at two different plate carriers, the Defender MOLLE and the ASP-C (Air Save Plate Carrier) to see how they stack up. Our testing has encompassed the better part of a year and this comprehensive review is the result. There’s a couple of video overviews embedded into this article as well as detailed photos to go along with it. Primary Armament Logistical Manufacturing (US PALM) has been around for the better part of two years now and is focused on making US made products and accessories for the shooting and tactical industry. Their innovative and much needed improvements to the AK platform are what originally drew us to them. This coupled with their craftsmanship (see below,) is why we have no hesitation in highly recommending their products. The US PALM AK Battle Grip is huge upgrade to the AK platform and one that was sorely needed. If you’re the owner of an AK, then you’ll know what you’re up against when it comes to the stock plastic or wood grips that stock AKs feature. Personally, my issue was the angle of the grip and the general lack of contouring that contributed to fighting with the stock grip all the time during reloads. 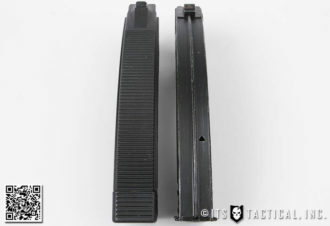 When my weak side had would come off the firearm to grab for another magazine I’d constantly fight to keep it where I wanted it. Not to say it was impossible to control, but I didn’t know what I was missing until I tried out the AK Battle Grip for the first time. 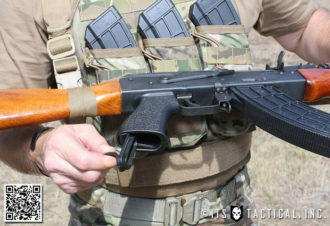 It was drastically easier to manipulate the AK one-handed and led to not only being able to stabilize it easier, but ensure it stayed in the direction I wanted it to during mag changes. 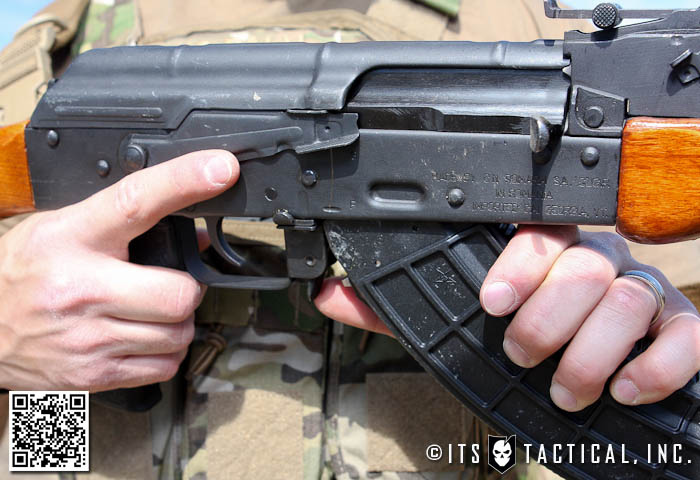 The contour of the AK Battle Grip does exactly what US PALM says it does, it drives your hand up to ensure a positive grip. I’d also add that the increased circumference of the Battle Grip aids in stability. A few of the US Palm accessories like this AK Battle Grip and their AR Grip are manufactured by Tango Down utilizing TD’s aerospace polymer. I say this also because if you’re familiar with Tango Down, you’ll notice their signature Dry-Lok plug in the bottom of the grip. This will enable you to store ear pro, batteries, etc. in the bottom without worry of it getting wet in a downpour. 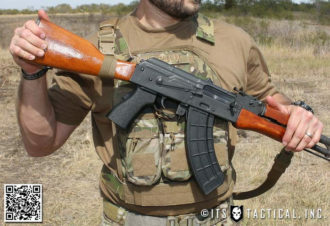 Another winner with the AK Battle Grip is that it’s designed to fit nearly every AK variant out there, from 47s, 74s, AKMs and RPKs. They’re available in Black, Flat Dark Earth, Brown, Red Bakelite and weigh 5.8 ounces soaking wet. 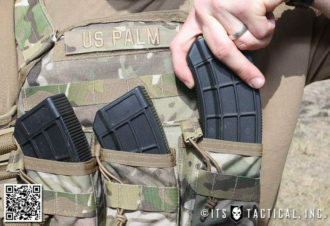 US Palm’s AK30 represents a significant improvement from other polymer AK mags on the market today. Produced by Tango Down from the same great aerospace polymer, the AK30 certainly gives traditional metal mags some steep competition. While the AK30 still features a stainless steel internal cage to support the front and rear lugs, the use of polymer is now a proven material by Tango Down with their ARC magazines and by Magpul with their PMAGs. Like we were, you’re probably curious how the feed lips will hold up over repeated abuse. 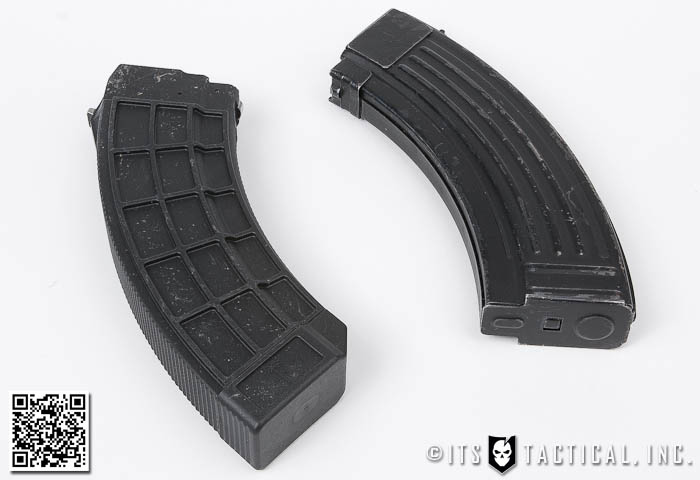 So far we’ve put around two hundred rounds through the few we have and even dropped full mags repeatedly on their feed lips with no damage reported other than scratching. While further torture testing is certainly in order and coming, we’re very impressed with how they’re built. The AK30 features a five sided box configuration with a bonded two piece body and one piece endcap that are molecularly bonded. While no disassembly is possible, US PALM states that it’s not necessary. The chrome silicone spring is heat treated, stress relieved and US Mil Spec corrosion resistant coated. Life expectancy for the spring is 100,000+ cycles. The holes in the follower also allow the gunk and water to easily flow out during cleaning. We haven’t tested this feature, but it appears to function as described. 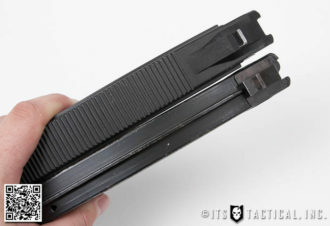 I particularly like that the waffle-pattern body coupled with the ridged spines creates a positive grip during mag changes. More so than the metal mags, hands down. The AK30 comes in 7.62 x 39 only and available in Black, Brown and Flat Dark Earth; each weighing approx. 7 ounces. 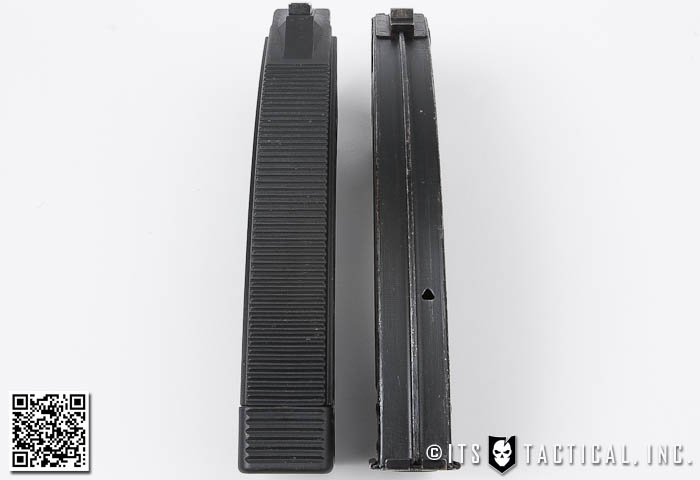 Another great option for your existing metal mags is that US PALM is now offering an AK30 rebuild kit to replace the followers and springs with an upgrade to the same follower and spring used in the AK30. 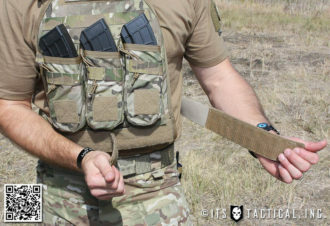 The Defender MOLLE plate carrier from US PALM is advertised as a complete system that can be easily donned in the middle of the night when you hear that noise that none of us are hoping to hear. We found this to be very accurate, as with the easy to secure straps and many configurations the Defender is available in, it’s certainly fast. That’s not to say that other plate carriers aren’t also easy to don quickly, just to confirm that it is easy to put the Defender on in a hurry. 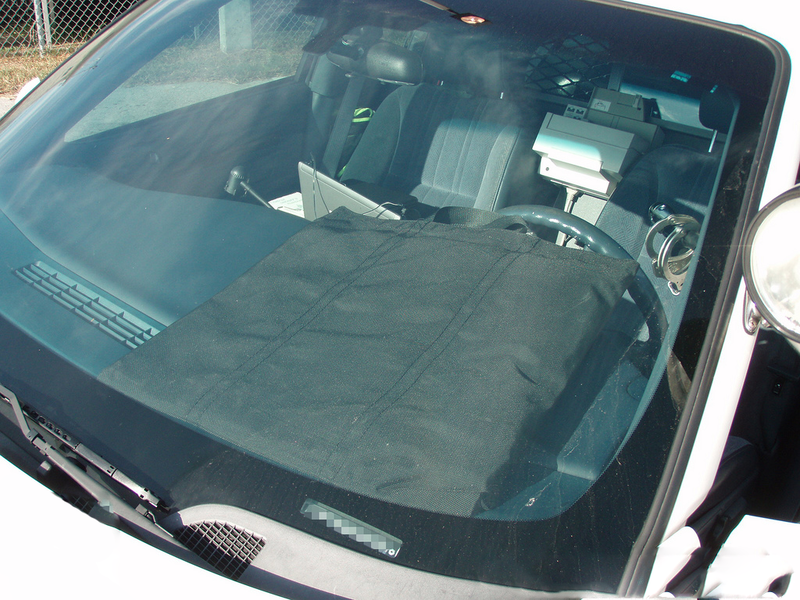 This is thanks to the large 2″ wide webbing/velcro straps that overlap each other in the lower front of the carrier. Even if you get the straps twisted while you’re putting it on in a hurry they’ll still secure to the velcro enough to allow you to move out quickly. The only potential that I see with storing this rig next to the bed ready to roll is that you’d have to leave the straps undone and hope that when you grabbed at it in a hurry they didn’t stick to one another and add to the confusion of the moment. 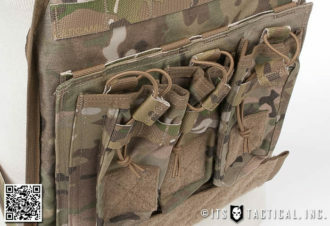 Shoulder strap adjustment is handled though 2″ wide webbing shoulder straps with full length velcro for adjusting to different sizes and shapes. Obviously if you’re tossing this on in the middle of the night, you’d already want to have these properly configured. The Defender comes standard with a single front IIIa armor panel in the front and a second can be added for the back for a modest price. 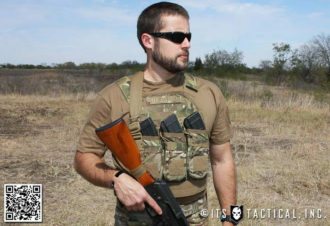 As prices change you’ll have to check the Website for current pricing, but this is a very cost effective way to have your own body armor at the ready. It will also accommodate plates if necessary, so it’s definitely versatile in that regard. 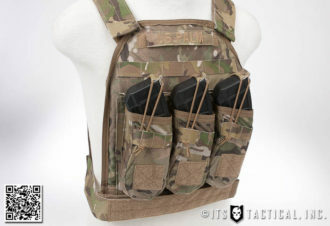 Another thing that gives the Defender versatility is the MOLLE option on the particular Defender we’re reviewing. 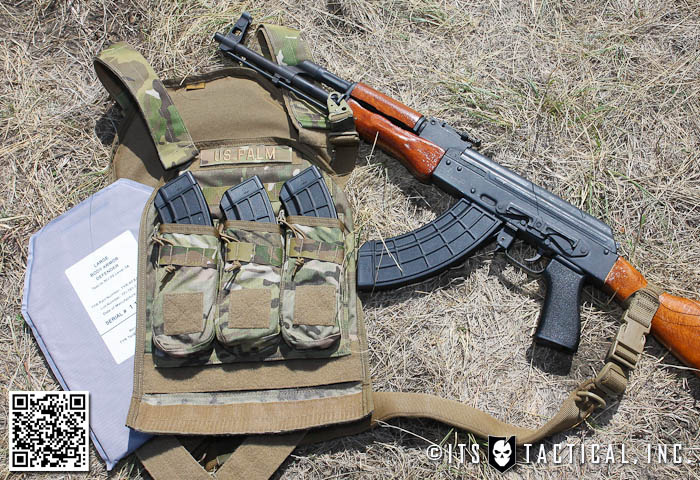 As you’ll see in the photos we have this configured with a Triple Cell AK47 Pouch, but the possibilities for configuration on a MOLLE carrier are certainly endless. As mentioned earlier, US PALM also manufactures different versions of the Defender to allow you to have many choices in finding what’s right for you. The Defender Handgun makes the most sense to me for most home defense use in the case of a home invasion, but if clearing the house with an AR like I would, the Defender AR-15 might make more sense. One last thing to note is the Defender MOLLE features a small 1″ loop strip on the front for attaching a name tape or the last word you want an intruder to read. I know I can think of some choice words for an embroidered name tag! You can get the Defender MOLLE in 500D Cordura colorways of Black, Coyote, Ranger Green and Multicam with many different size configurations. 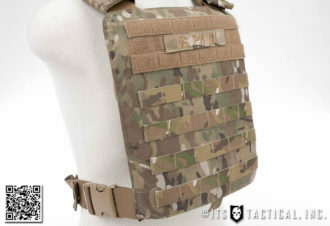 While we don’t normally publish pricing in articles, I’m going to break our rules by saying that at $399.99 for a US made plate carrier and two Level IV stand-alone plates (US PALM rates at withstanding .308 AP rounds,) the Air Save Plate Carrier is a fantastic deal! It may be a rectangular design and not contoured as traditional SAPI plates are, but I had no problem getting a good stock-shoulder weld wearing it. The complete package with plates is fairly heavy as far as plates go, weighing 17 lbs. but certainly not unmanageable. A few features I really like about the ASP-C is the fact that the steel-ceramic composite plates have a rubber grommet around the exterior edge. While adding bulk and bringing them to 3/4″ thick, it’s nice if you set them down on a hard surface. The 500D Cordura carrier is very nicely made with spacer mesh on the backside of the front, back and removable shoulder pads. The spacer mesh is padded as well which adds to the comfort of wearing 17 lbs. around. 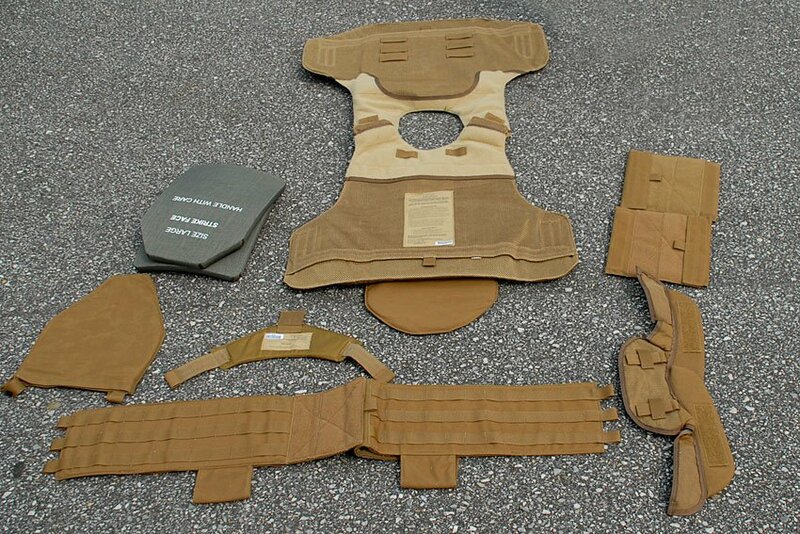 Shoulder straps adjust similar to the Defender, but are sewn in versus moving through a looploc like on that rig. There’s a single row of PALS webbing sewn on each shoulder strap for attaching various accoutrements or pieces of flair if you work at Chachki’s. 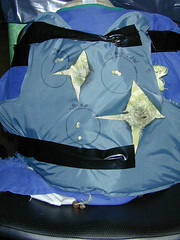 Plates get inserted though a velcro closure flap at the bottom of each panel, which features a webbing pull tab. The velcro is too strong to be able to use the pull tab as a stand-alone opening method and is more to aid in opening once you get your hand in there to break the hook. The top two rows of PALS on each side of the carrier are loop covered for attaching identifiers, morale patches or even more flair! There is only one size that the ASP-C comes in, but it adjusts to all the body types we’ve tried the rig on. Lastly on adjustment the sides are secured with sewn webbing and an adjustable ITW Nexus SRB (slide release buckle) for quick release. There’s also a small elastic keeper to secure the loose webbing after adjustment. The ASP-C is available in one size in either Black, Coyote, Ranger Green or Multicam. Again, we feel this is an incredible deal for Level IV rated plates and a carrier!